When Joshua Raimond was 13 years old, his friend’s father gave him a ride home in his Porsche. Joshua had never ridden in a car like that before and in the moment, a passion was ignited. Oddly enough though, not as much for the style of the car, but for the sound of that engine. “I’m more of an engine guy than a car guy,” Raimond says. Fast forward a number of years, and when he left the United States Marine Corps after four years of service, Joshua decided to pursue his passion and make a career out of working on Porsche racing engines. He went to work for the renowned SoCal shop, ANDIAL. Formed in 1975, ANDIAL’s name is an anagram made from the names of the founding members; the late Arnold Wagner AN; Dieter Inzenhofer DI; and former PMNA president and current consultant Alwin Springer AL. Porsche Motorsports North America purchased the brand in 2013. While there, a manager told Joshua if an engine needed to be built quickly, it did not necessarily go to him (Joshua), but if it needed to be built unquestionably perfect (like for a 12 or 24 hour endurance race) he was indeed the guy. Despite the high praise, Joshua moved on, deciding to attend college where he majored in physics at Cal. Unsurprisingly, upon graduation, he found his way back into the motorsports industry, this time building racing engines at Hasselgren Engineering. While there, he created and managed Hasselgren’s first Porsche race engine program running three teams, brought into commission and ran the AVL test cell, programmed Bosch Motorsport and Pectel ECU’s, traveled to support Daytona Prototype data acquisition and engine support. Truth is, he did a little of everything. Joshua relied on his engineering and physics background, as well as his previous motorsports experience, and began contributing to the design side. After seven years, he has contributed to three clean sheet engine projects: the first two were for a scooter project, while the current one is a 235 cc engine for the three-wheel market. By the time Joshua arrived at Pinnacle, where the company’s primary focus is automotive (specifically the three-wheel and two-wheel markets), he wanted to transition to design, but forty percent of his work was still focused on building. 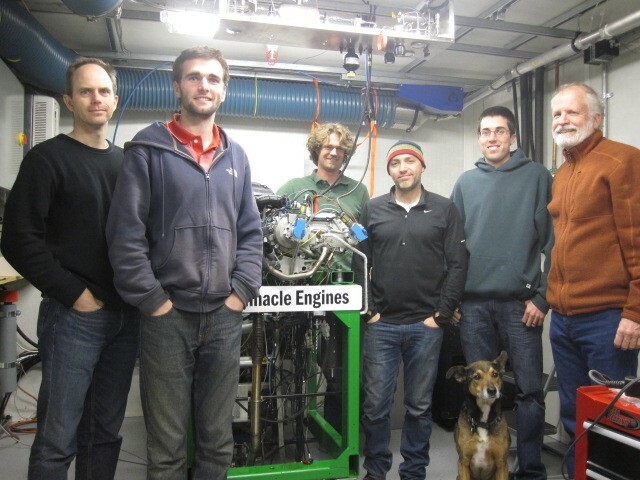 However, in his design hours, one of his first projects was a flow bench rig for Pinnacle’s novel sleeve valve engine technology. After this “living on the edge” foray, Joshua re-discovered his passion for motorsports. While trying to determine how to transition to a new career, he started building engines again for money and while doing so, discovered a non-functioning AVL test Working in the Hasselgren dyno - 3.2 L short stroke 911 engine cell. He managed to get it working again and with the guidance of an experienced mentor, began teaching himself how to calibrate ECUs, how to do launch control and rev-limiter PID, and how to properly map an engine. Joshua was satisfied for a while, but still wanted to move on when good fortune smiled. “Frankly it was just luck that Pinnacle Engines wanted to hire me,” he admits. “I saw an available design opportunity and wanted to see if I could fill it.” He joined a company of 30 employees with a testing facility in San Carlos, including a main building for design and simulation. There is also an office located in India. Joshua also relies on a MATLAB script to narrow down what can be tens of thousands of possible valve spring designs. He specifies wire properties and geometry, spring frequency, the necessary load at installed and full lift, even the cost of materials. Ultimately, he arrives at a solution that works with all the other components, crankcases, and all the other things that define the space: including a Converge CFD combustion simulation, port design, and injector spray pattern—anything that is captured. And the manufacturing location depends upon the customer. The general intent is that the customer specifies the engine, Pinnacle designs the engine, creates the 3D and 2D documentation to take it into manufacture, and deals with tier one feedback, but the customer ultimately takes that data and mass produces the parts. So essentially, Pinnacle licenses the technology created and becomes the steward of it. Joshua’s next step was to go to the boss. “Yeah, it was a hard sell,” he admits, “but I’m a hard salesman. 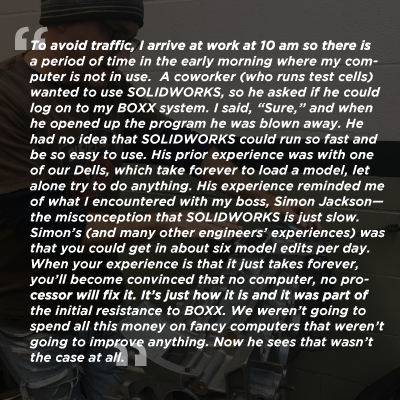 I really just had to put my foot down and say all I hear all the time as the admin are SOLIDWORKS issues.” He discussed his findings regarding clock speed and after “a lot of kicking and screaming” received approval for BOXX workstations. He also managed to finagle better graphics cards and 4k monitors that provided ample real estate when looking at large assemblies. Prior to the new BOXX APEXX workstations, Joshua says that substantial investment in the design department had never been a serious consideration. “We were crippled with the processing time,” he says, “but also graphics cards and everybody had two different monitors, etc. The design department is the space between having an idea and making it reality so it was frustrating that we were under-investing in it.” Having successfully pleaded his case, Joshua tried to “get the best of everything.” He called BOXX and spoke to BOXX MPD Performance Specialist Rich Petit who he says was “fantastic.” “Rich was great to talk to,” he recalls. “I told him what we were thinking, that we wanted quotes, and he sent them right away. He was flexible regarding whether we wanted this, that, or the other. It felt like I was talking to someone who was genuinely interested in our problems and wanted to help us solve them any way he could. It was reassuring knowing that I was working with someone in the know, who was giving us options, and gave me space to make the decision. He’d give a quote, and I would approach my boss who would ask about something else and I’d circle back to Rich. 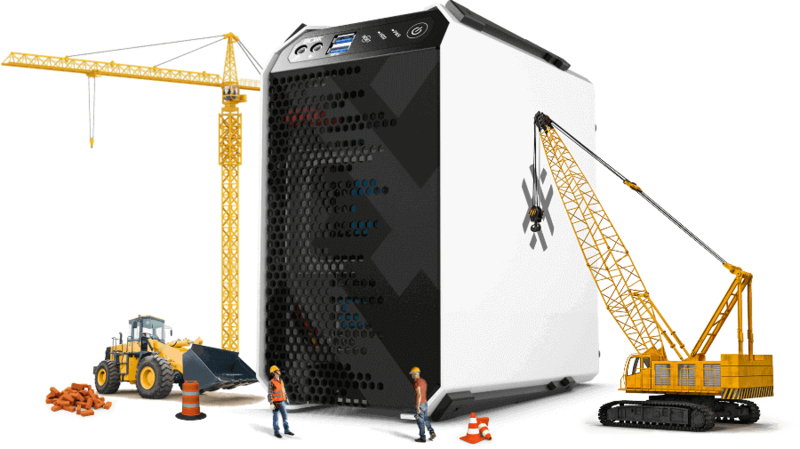 He always provided the information I needed to make the right decision.” Pinnacle was finally sold on the APEXX 2 equipped with NVIDIA Quadro GPUs and SSD drives. He also added dual 4K monitors for each designer.